More than three years after discovering a never-before-seen subatomic particle, physicists now know how these particles — called pentaquarks — are put together. 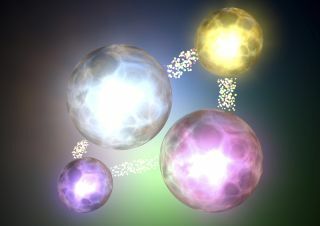 New research reveals three completely new kinds of pentaquarks and shows that they are each made of two components: one three-quark cluster called a baryon and one pairing of quark and antiquark called a meson. Quarks are subatomic particles that come in six types (up, down, strange, charm, bottom and top). They are the building blocks of protons and neutrons, which are made of three quarks apiece. These three-quark particles are also known as baryons. Another important particle type is the meson; these are each made up of a quark and an antiquark. Antiquarks are the weird antimatter cousins of quarks. In the 1960s, when physicists were first theorizing about all of these quarks, they realized that there was no reason not to have particles made of four or five quarks, Skwarnicki told Live Science. But there hadn't been experimental evidence of five-quark particles, or pentaquarks — that is, until 2015, when Skwarnicki and his colleagues discovered the objects among the particles created by collisions in the Large Hadron Collider in Geneva. At the time, Skwarnicki said, the data were a little hazy. Since then, the researchers have increased the amount of data they have on these pentaquarks by a factor of nine. That led to a much sharper picture, Skwarnicki said. Most importantly, the new data reveal the internal structures of these pentaquarks. Previously, Skwarnicki said, it wasn't clear how the five quarks were arranged inside the pentaquark. Did they all interact with one another? Or were there instead two clusters — one three-quark baryon and a meson (the particle made of a quark and an antiquark) that interacted with each other? The structure of a pentaquark, a subatomic particle made of a charm quark, an anti-charm quark, two up quarks and one down quark. The new data reveal that it is the latter case. Based on how the quarks decay — they're unstable and exist only briefly before altering their configurations — they must be made of interacting baryons and mesons, Skwarnicki said. The pentaquarks are made up of a charm quark, an anti-charm quark, two up quarks and one down quark. They have different masses because the quarks exist in different quantum states. "The significance of the new observations is that it's now pointing in one clear direction," he said. Each pentaquark is made of a baryon with three quarks inside and a meson with a quark and an antiquark. "It's like two separate balls of quarks sticking to each other," Skwarnicki said. Skwarnicki presented the results March 26 at the physics conference Rencontres ﻿de ﻿Moriond in La Thuile, Italy. The researchers plan to take further measurements to confirm their findings, Skwarnicki said, and they plan to search for more pentaquark arrangements. "I am actually confident that in the future we will see more of these pentaquark-type particles," he said.